Meatball. It’s such a simple idea but yet so difficult to make it right. In almost every cuisine you will find some sort of meatball dish. My favorite has to be the Lion’s Head dish from Chinese restaurants. It’s named that way because the meatballs look a lot like the head of lions. If you don’t believe I’m sure you’ll believe Wikipedia! I have never tried making meatballs because I know I’ll fail big time, most likely they’ll turn out super dry. I rather leave meatball making to the professionals. There are a lot of places in the city that serves up some damn good meatballs and yes I also include Ikea but when a place called themselves The Meatball Shop you gotta pay attention. 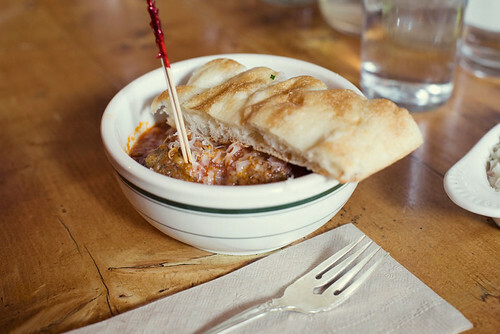 It seem like everyone I know had gone to The Meatball Shop, few even multiple times. What kept me from running to try were stories, mostly tweets, about 2 hour plus wait on a weeknight. But me a lover of meatballs must go one of these days 2 hour wait or no 2 hour wait. It was a damn damn cold Sunday when I met up with my friends Jane and Peter for brunch at The Meatball Shop. Either it was too cold for a lot of people or we were there early enough (12:30pm) or we were lucky but we got sat right away at the communal table. This place is small and they sure jam packed a lot of tables into the small space. 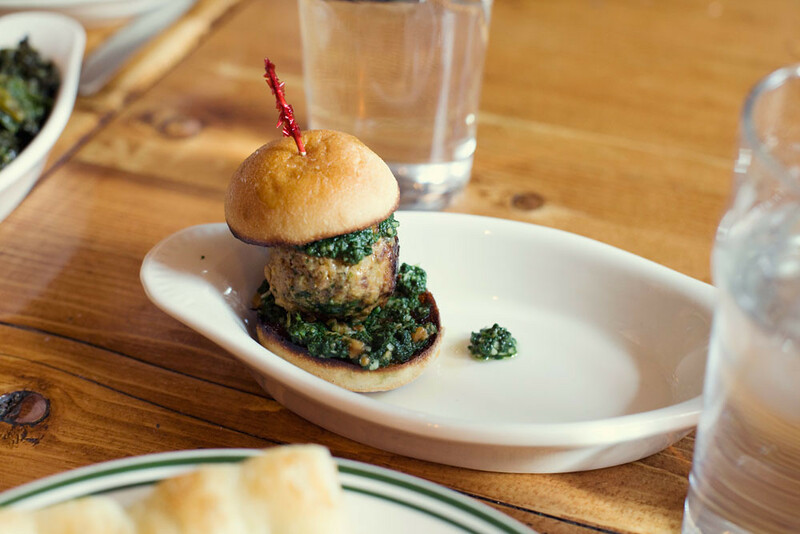 So here’s the deal with The Meatball Shop. On their laminated menu you can mark what meatballs to go with what sauce. Or you can pick what sliders you want or what meatball sandwiches you want. The choices were pretty endless. I got the spicy pork meatball with the mushroom gravy over polenta. 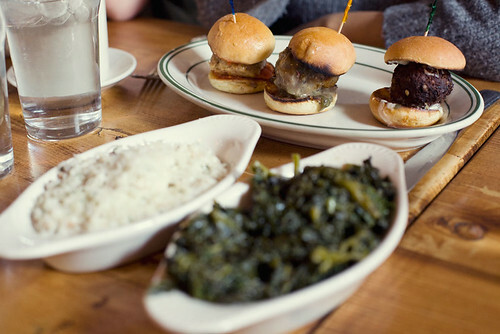 I also got a side of sauteed kale with garlic and a beef meatball and pesto slider. Jane got 3 sliders, vegetarian meatball with parmesan sauce, spicy pork with mushroom gravy and chicken with tomato sauce. Peter got chicken meatball with meat sauce with a side of that day’s risotto special. Who eats salad at a meatball shop?! Apparently Jane wanted to, she was eying the plate of salad the girl next to her was eating. Our food came and it came quick. Don’t think we waited long. My bowl of spicy pork meatballs sitting nicely in the mixture of polenta and mushroom gravy. We quickly dug into our food. Oh wow my bowl was the perfect antidote to the cold weather that day. 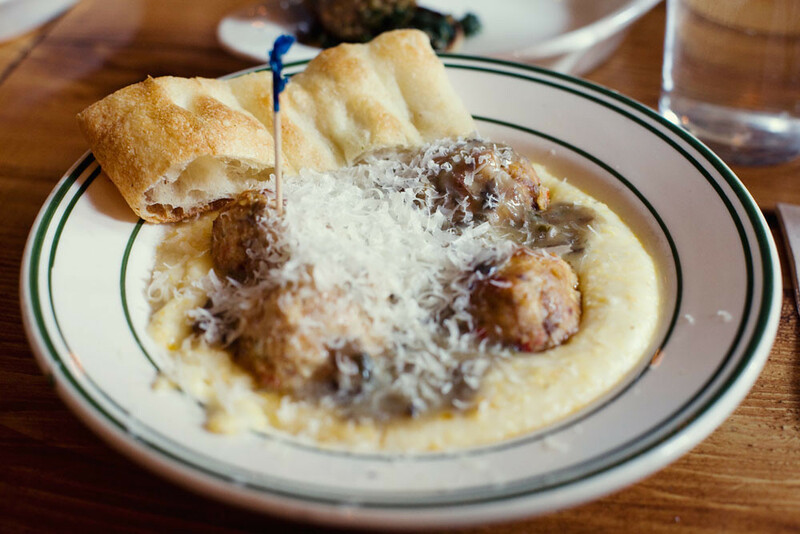 The hint of spiciness in the meatballs was nice and the polenta, mixed with the mushroom gravy, made my tummie happy. Total comfort food. I think we all agreed that the only meatball we didn’t like was the vegetarian. And it wasn’t because it was vegetarian but it just didn’t taste as good…eh well it maybe because it was not made out of meat. So. Anyways. I really enjoyed The Meatball Shop, the service was speedy and friendly, the space was a little tight but not too bad, and the meatballs were great. Also the prices weren’t outrageous especially for that area. If you like meatballs as much as I do, get over there.